Campbell Town (pop ~800) is a major sheep farming centre in Tasmania's midlands, and the Campbell Town wool auctions have seen world-record prices set. The Midlands Highway, the main route between Hobart and Launceston passes through Campbell Town. Campbell Town's Saxon merino sheep were introduced over 150 years ago, but the historic Winton estate even pre-dates that. The well-preserved buildings and attractive gardens are open for public tour, with highlights including the woolshed and original blacksmiths shop with bellows and forge. A large part of Campbell Town's attraction is its history. Numerous Campbell Town churches of various denominations (including St. Luke's Church of England, above) are classified by the National Trust. Campbell Town was the birthplace of Harold Gatty, the navigator on Wylie Post's first-ever round-the-world airplane flight, and the Gatty Memorial recalls this feat. Other historic markers include the Campbell Town railway station, site of the first telephone call in the southern hemisphere, and the showgrounds, which are part of ongoing history - the Midland Show is the oldest continuous one in Australia. 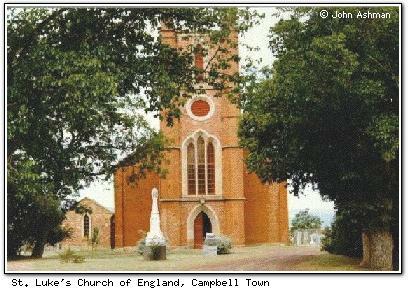 Campbell Town was named after the wife of Governor Macquarie, whose maiden name was Elizabeth Campbell. It has one 4½-star, one 4-star and one 3½-star accommodation facility (RACT rated).